There are many factors to consider in the satellite signal chain, they can all affect how much signal is received by the receiver, thus reducing the quality of the picture and sound. Use a high-quality dish, size is not everything, some smaller quality dishes such as ChannelMaster, will provide better reception than larger cheaper dishes. Always use the highest quality cable, damaged or poor quality coaxial cable will reduce the signal levels delivered to the receiver, causing lower or loss of signal. Avoid unnecessary connections, these will reduce the signal, run a straight single length of cable from the LNB to the receiver. Keep the cable dry and above ground level, never place it underground unless it is placed and protected by waterproof piping. Unprotected cable will degrade quickly and will have to be replaced after a year or two. Signal strength is the percentage of signal to noise ratio, the measurement of signal strength from the LNB to the receiver. 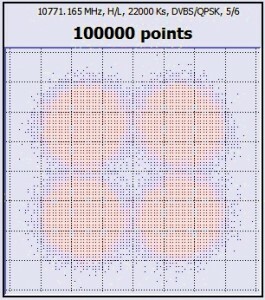 This is the signal strength of the Intermediate Frequency (IF) output from the LNB. In most cases, signal strength is always strong – around 90 to 100 percent. Signal strength is just an indication of how strong the received signal is. The receiver should operate with signals up to 100%. 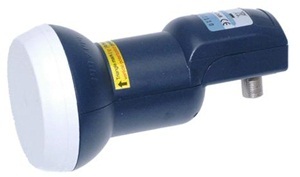 Low signal strength readings can be an indication that there is a problem between the LNB and the receiver, this could be caused by defective connectors or cable. This is a measurement of the Bit Error Rate (BER) of the received signal from the satellite. Which ever type of modulation is used, QPSK or 8PSK, they all use a form of Forward Error Correction (FEC). This determines if the signal being sent is being correctly received without errors. Any received errors will be corrected in the receiver by bit substitution in the FEC process. The Signal Quality reading on the receiver is displaying the receiver Bit Error Rate (BER) from the satellite – and how much, or how little error correction is taking place. The higher the signal quality reading on the receiver, the lower the Bit Error Rate. Signal quality readings are usually between 60 to 80% and will provide good quality picture and sound, corresponding to a low Bit error rate. Low signal quality readings can result from many factors, improper dish alignment, old or poor quality LNBs and low quality or damaged coaxial cable. In some situations, as with overseas reception of the Astra 2E and Astra 2F satellites, the dish is simply not large enough to provide a signal that exceeds the satellite receiver threshold for reliable reception. The weather can seriously affect satellite reception, rain, clouds, hail and snow can block or reduce the signals. A few droplets of rain on the LNB can reduce the strength and quality of signals significantly, this is a major problem when receiving weaker signals. In areas with significant rainfall, using a LNB protector (LNB umbrella) will protect the LNB from rain, frost, dew and snow. Dish size is paramount in the reception of weak signals outside intended reception areas. This determines how much of the weak signal from the satellite is gathered for the LNB. Although other elements are important in the reception chain, such as LNB type and the type of receiver used, there is no substitute for more signal from a larger dish. Dishes are usually sized by their diameter, so size can be confusing if you are not comparing dishes of the same shape. A dish need only be about 40% wider to produce twice the signal; a 1.2 M dish will give nearly 50% more signal than a 1.0 M dish. To ensure that your dish is large enough you need to know the strength of the signal at your location. Theoretically, the lowest noise figure obtainable from any device is limited by any components in the signal chain with the highest thermal noise. The first component in the chain would be the detector circuit and on a Universal LNB this would be a pin diode. At Ku band, the detectors are rated at manufacture to about 40K which converts to a figure of 0.5 dB. Presently the LNB market is active by those selling what appears to be an extraordinarily good device, some use the best of the component batch – and end up with good performance overall (rare). Some modify existing LNBs by the use of fancy smoothing circuits to eliminate any further incoming noise from the power supply – there are definite improvements when used with cheaper receivers, especially those with switch mode supplies (few). Some simply take the lowest noise figure during tests at a particular frequency and then claim that this is the figure of the LNB (so you could have a 0.5dB LNB at 10.8GHz which has a 1.1dB noise figure at 11.6GHz, however, it will be rated at 0.5 (depressingly common). The LNB gain tells us how much the incoming signal is amplified before being sent off down the coaxial cable to the receiver. The range of gain specified is between 40dB and 70dB (somewhere between 10,000 and 4,000,000 times the incoming signal power). At first sight, the highest gain you can get would be the obvious thing to look for; however that is not the only criterion when it comes to LNBs. 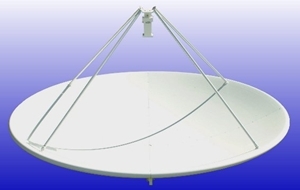 When you have a large dish looking at high power satellites, the gain can be so high that the receiver is overloaded with signals. These can ‘swamp’ the lower powered satellites signals. Even if the receiver itself can handle a massive amount of signal, there can be problems within the LNB itself when large amounts of amplification are employed. This leads to the generation of spurious signals and distortion. This distortion will interfere with the reception of your signals. To let the demodulator in the receiver work effectively, the gain at all frequencies, should be the same. This is not a very difficult requirement to meet, except perhaps at the edges of the band, as long as the LNB is constructed properly. Skew refers to the angle of the LNB relative to the rest of the dish, you are maximising the gain of the LNB. This could be the difference between a good watchable picture or poor reception. All geostationary satellites are located above the equator (the Clark Belt). They are placed here to match the rotation of the earth. Inside a satellite’s footprint, LNB skew is not all that important, however as you approach the fringes of the signal footprint it becomes ever more crucial to getting good reception. The LNB is kept in place by either a screw or a nut. Loosen these and it will be possible to rotate the LNB left or right. The degree of tilt varies depending on your location. The satellite appears to be tilted as viewed from Earth, this means the LNB has to be tilted to a similar angle so that it matches the geometry position of the satellite. The degree of tilt varies depending on both your location and on which satellite you want to receive. Skew varies from about 15º in the north of Scotland to around 22º in the south west of England, always rotate clockwise as viewed facing the front of the dish. Most commercial satellite dishes have a certain amount of skew built in, the LNB will appear to be lopsided. 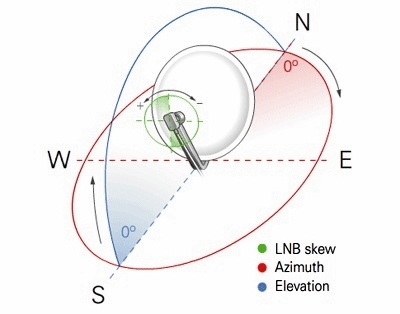 In areas where the signal is strong, skew is not such an issue, once outside the main reception area as with Astra 2D overseas, skew becomes important The LNB is locked in place by either a screw or a nut. Loosen it and the LNB will rotate in its housing. Rotate it one way or the other until the signal quality is maximised. Forward Error Correction (FEC) is a technique used for controlling errors in data transmission, FEC is accomplished by adding redundancy to the transmitted information using a predetermined algorithm. Part of the data stream is used solely to correct errors in the downlink stream from the satellite. This prevents the picture breaking up. A FEC of 2/3 means that every third bit of data is used to correct errors in the previous two bits. Here signal would be more robust and can be received easier, with less breakup in rain, for example. It is less efficient, with not so much data available to transmit the picture. A FEC of 9/10 means that just one-tenth of the data is used to correct errors, making the signal harder to receive and much less robust. It will break up more easily in weak signal areas, or when subjected to interference. For the broadcaster, 9/10 means that more channels can be squeezed in, at a higher data rate. The difference between FEC 2/3 and FEC 9/10 is that an extra 4.5dB ES/No is required to stay above the threshold. Currently, most UK PSBs use a FEC of 5/6, which is not very robust in fringe areas. Symbol Rate (SR) is the number of symbol changes (waveform changes or signalling events) made to the transmission medium per second using a digitally modulated signal. The Symbol rate is measured in baud (Bd) or symbols/second. ks/s is 1000 symbols / second. KHz is 1000 cycles / second. The most common Symbol Rates used for British TV and radio are 22000 and 27500, BBC HD channels use an SR of 23000, while Sky HD tend to use 29500. Bit Error Ratio is an objective measure of the quality of the digital TV signal after signal demodulation. The coding techniques, which are employed in the digital TV standards, are able to identify and correct a certain amount of errors. Consequently, bit errors can be tolerated up to a particular level without causing quality degradation of pictures or sound. CNR (also C/N) is the carrier to noise ratio. This is the power ratio (usually expressed in dB) between the received RF power in a carrier and the thermal noise power (kTB) in the same bandwidth. It is a measure of how “good” the signal is and how “easy” it will be to demodulate the transmitted information. It is typically measured at the output of the antenna or the input to the demodulator. Eb/No is the ratio (usually in dB) between the energy in 1 bit of a transmitted digital signal to the thermal noise power (kT) in 1 Hz. It is functionally equivalent to C/N and is related to C/N by the following formula: C/N = Eb/No + 10.log(R) + 10.log(B), where R is the transmitted information rate (bit/s) and B is the noise bandwidth (Hz). Es/No is the ratio (usually in dB) between the energy in 1 symbol of a transmitted digital signal to the thermal noise power (kT) in 1 Hz. In the case where the modulation scheme transmits 1 bit per symbol (e.g. BPSK) then Es/No and Eb/No are the same. Where there are multiple bits per symbol then the Es will increase (e.g. for QPSK there are 2 bits per symbol so Es/No = Eb/No + 10.log). Effective Isotropic Radiated Power (EIRP) is derived from the word isotropic which means equal in all directions. Effective Isotropic Radiated Power means the power levels that would be received at any location if an antenna were radiating equally in all directions. Therefore, a 37 dBw EIRP reading means that a perfect antenna would direct 37 dBw or 5012 watts per square meter in all directions. The reason that a transponder having rather limited power, typically in the 8 to 150 watts range, can apparently have such a high EIRP stems from the fact that this power is not radiated equally in all directions and is concentrated in a narrow beam (Spotbeam) aimed at the earth below. Ku-band transponders having a total power of 50 watts have EIRPs as high as 48 or 49 dBw when this power is directed into a tightly focused spotbeam. EIRP levels refer to the power of signals measured at the satellite downlink antenna. Official satellite reception maps (footprints), have very conservative values, this is good if you are inside the official reception area, as it is easy to determine the dish size required for reliable reception. However, satellites do not transmit in the way they are displayed on official footprints, so outside the intended reception area, it is mostly guesswork. Quasi Error Free (QEF) The point where the signal quality is enough to give stable reception, a level of errors that is defined as the “threshold” of where the system is working and where it is not. The “threshold of visibility” is another term sometimes used referring to a rate of errors that just becomes noticeable to a TV viewer. A good quality satellite receiver should have a low threshold, this is an important factor in receiving weak signals. SNR (also S/N) is the signal to noise ratio. This is related to CNR, but usually is only applied to analogue signals. It is the power ratio (again usually expressed in dB) between the received (and demodulated) wanted signal power in the baseband bandwidth and the thermal noise at the demodulator output in the same bandwidth. For example, in an analogue FDM/FM voice multiplex carrier the CNR would be measured in the bandwidth of the whole carrier but the SNR would be measured in the 4kHz bandwidth of one voice channel. A constellation diagram is a representation of a signal modulated by a digital modulation scheme such as quadrature amplitude modulation or phase-shift keying. It displays the signal as a two-dimensional scatter diagram in the complex plane at symbol sampling instants. In a more abstract sense, it represents the possible symbols that may be selected by a given modulation scheme as points in the complex plane. Measured constellation diagrams can be used to recognize the type of interference and distortion in a signal. By representing a transmitted symbol as a complex number and modulating a cosine and sine carrier signal with the real and imaginary parts (respectively), the symbol can be sent with two carriers on the same frequency. They are often referred to as quadrature carriers. A coherent detector is able to independently demodulate these carriers. This principle of using two independently modulated carriers is the foundation of quadrature modulation. In pure phase modulation, the phase of the modulating symbol is the phase of the carrier itself. As the symbols are represented as complex numbers, they can be visualized as points on the complex plane. The real and imaginary axes are often called the in-phase, or I-axis, and the quadrature, or Q-axis, respectively. Plotting several symbols in a scatter diagram produces the constellation diagram. The points on a constellation diagram are called constellation points. They are a set of modulation symbols which comprise the modulation alphabet. Also, a diagram of the ideal positions, signal space diagram, in a modulation scheme can be called a constellation diagram. In this sense, the constellation is not a scatter diagram but a representation of the scheme itself. Upon reception of the signal, the demodulator examines the received symbol, which may have been corrupted by the channel or the receiver (e.g. additive white Gaussian noise, distortion, phase noise or interference). It selects, as its estimate of what was actually transmitted, that point on the constellation diagram which is closest (in a Euclidean distance sense) to that of the received symbol. Thus it will demodulate incorrectly if the corruption has caused the received symbol to move closer to another constellation point than the one transmitted. This is maximum likelihood detection. The constellation diagram allows a straightforward visualization of this process — imagine the received symbol as an arbitrary point in the I-Q plane and then decide that the transmitted symbol is whichever constellation point is closest to it. A sun outage, sun transit or sun fade is an interruption in or distortion of geostationary satellite signals caused by interference from solar radiation. The effect is due to the sun’s radiation overwhelming the satellite signal. In the northern hemisphere, sun outages occur before the March equinox (February, March) and after the September equinox (September and October). At these times, the apparent path of the sun across the sky takes it directly behind the line of sight between an earth station and a satellite. The sun radiates strongly across the entire spectrum, including the microwave frequencies used to communicate with satellites (C-band, Ku band, and Ka-band), so the sun swamps the signal from the satellite. The effects of a sun outage range from partial degradation (increase in the error rate) to a total destruction of the signal. The effect sweeps from north to south from approximately 20 February to 20 April, and from south to north from approximately 20 August to 20 October, affecting any specific location for less than 12 minutes a day for a few consecutive days. 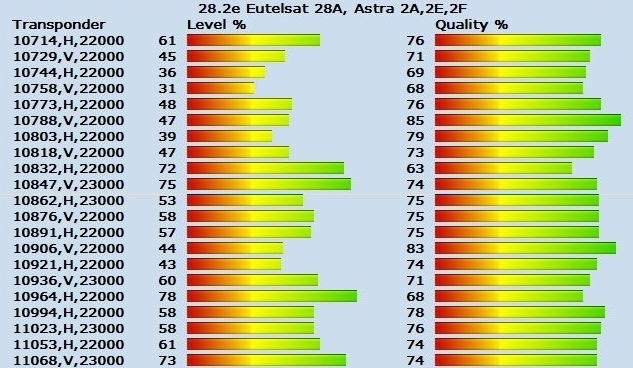 Viewers within the central footprint in the British Isles and nearby Europe should not be affected, those in fringe areas will lose the signals from Astra 2E, Astra 2F and Eutelsat 28A. At around 10.40 to 10.50 CET, signals from Astra satellites at 28.2º east will be lost completely as they move in front of the sun.